I do know a few things about this photo sent to the Cracker Jack Division of Borden, Inc. in 1972. It was sent to the company to honor their 100 Year Anniversary of the origin of the company 1872-1972. The Company started out as F. W. Rueckheim and Bro. and continues to this day as a small subsidy of RECOT, Inc! The photos shows a group of teens with cases of boxes of Cracker Jack throwing them to the happy crowd viewing the parade! 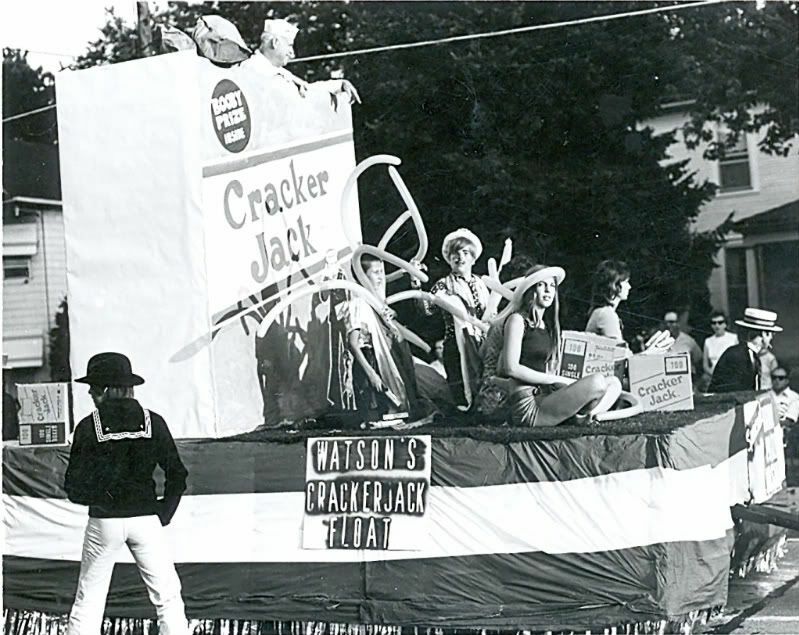 Notice the older fellow dressed as a sailor in the Cracker Jack large box on the back of the float. Instead of the customary Prize Inside it says Booby Prize Inside! Perhaps he is their advisor or teacher! I don't know the reference to "Watson", perhaps the town or school that entered the float? Cute photo and neat float, Alex. Thanks for posting it.